General / Re: What game do you have the most copies of, and why? It'd be cool to see the order in which you added games to your collection from the very beginning, see how many games you added each year, that kind of thing. I've been in the process of moving and setting up game room in the new house so haven't had a chance to post pictures of my pickups this week. Hopefully in the next week or so. 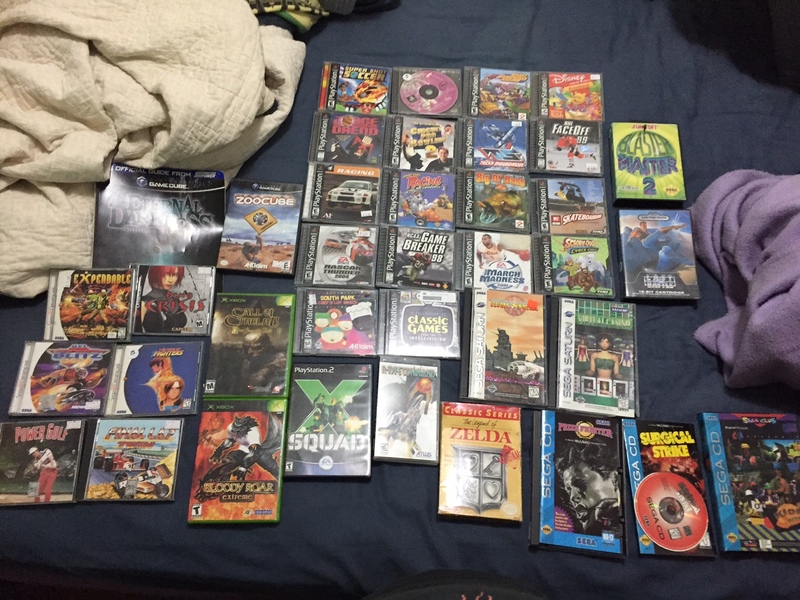 I got a sweet 27" Triniton for the new room and picked up a few more games for my ps1 set. along with a few games for some other systems. Down to 76 games to go for PS1! Retro Gaming is still super popular in the PNW, we've had multiple new stores open or will open soon, our community sets up 5-6 different collector swaps a year and the Portland Retro Gaming Expo is one of the largest retro conventions in the nation. If we are in the decline, I think it's going to be a very slow one. I think the reason there has been less forum presence is possibly also because of the rise of new collection tracker alternatives. Gameye, GVN, VGPC and more all have collection tracking apps and in the FB groups I belong to, the members usually use those over VGCollect. We just need more new blood that aren't silly trolls like Seether. Had some great pickups this weekend! 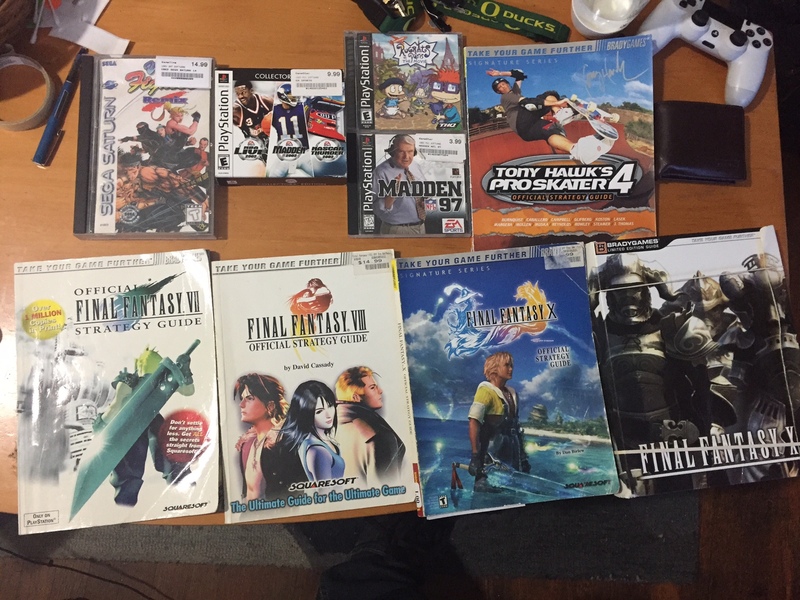 Hit some local stores on my day off Friday and caught a store seriously slipping on the price for a very rare and expensive Saturn variant and got a bunch of Final Fantasy strategy guides for a $1 a piece. Then went to a regional swap and got some great stuff! Really excited to check out Call of Cthulhu, Iron Storm, Bloody Roar Extreme, and Blaster Master 2, among others. I'm also down to 80 PS1 games left for the full set! My PS2 from like 2001 still works, don't know how or why, and it doesn't play blue discs, but it still plays everything else. I use a slim though at the moment, faster/easier for changing discs. FreeMcBoot is great if you don't want to use the laser. Nah, I'm glad you bumped it. Your post is what the topic was supposed to be but it got mostly sidetracked. In Portland, we have had several new retro stores open recently. On a good day I can hit between 8-10 stores in a 25 mile radius. I run out of daylight before I can hit all the locations. Most stores try to price near or at market but I frequently catch stores slipping, listing $25 games for $5, listing $70 for $40 and more. The stores with good pricing and friendly staff stick around. The ones that don't die quickly. It'll all eventually die because it's brick/mortar retail but the scene in Oregon is booming right now. Most of the remaining stores in the area range from terrible to average when it comes to pricing and/or selection. Unfortunately the stores that I used to catch slipping a lot are all gone for the most part. The remaining ones are very careful about their prices, either charging ebay prices or well above them. Sadly, the store with the best prices (consistently 10-25% under ebay on everything) went out of business earlier this month. One thing I'm trying to understand is why Level 7, the store that is buying out Buy Back Games, is seemingly thriving. They're not a bad store by any means, in fact their selection of games is pretty stellar, but their pricing is almost invariably ebay or higher, which makes me wonder why people would even bother shopping there when they can get a similar deal on ebay pretty easily. They recently opened a new location a few months ago, and now with their recent acquisition are seemingly going to open a 4th. I can't imagine a retro video game store pulls that kind of money so I have to assume the owner has some outside source of income fueling the company. There's another chain in town called Doc's that is owned by a dentist whose dentist salary is what has kept his stores afloat all these years. At least in our area I think the stores that survive are the ones who price the Gamecube/N64/GameBoy stuff at market or above to help them cover their costs but are laxer on other less popular stuff because they know it won't sell to the collectors out there who are looking for a deal and know better regarding prices. I am curious how some of these stores do stay in business though. Especially the ones with bad pricing, there is one store that prices everything including stuff that would be $2-$3 at $9 to $10 but will often price stuff $30-$40 at $20-$25, it's baffling and I don't why they don't price the cheap games cheaper, some have sat there for years! Once again, great transaction. Great communication, shipped it fast and shipped it well and I'm very satisfied. Buy confidently. I ended up just uploading my entire collection into the gamevaluenow database, it tracks approximate value. Pricecharting does it too but i find gamevaluenow more intuitive. haha, I found the opposite. I used VGPC because I found it simpler and it allowed me to import my collection. GVN crashed every time I tried to import. I couldn't figure out how to import my collection into either one. So I just did it manually. I also just like GVN's visual presentation more. [...] Thinking about also having my collection uploaded to Gameye to be able to readily identify what to look for on the go but keeping up three separate databases might be a tad ridiculous. You didn't ask for an opinion, but yes - more than a tad I would say. But hey, if you have the stamina to juggle three, more power to you. Ha, yeah it does sound a bit ridiculous. 2 is likely more than enough. But I get a lot of enjoyment about tracking and organizing my collection so I still might do it! General / Re: Who has the largest collection on the site? I haven't seen a bigger collection than theflea. It'd be fun to see a top 10 list on the site.